So I was wondering what I was going to spend my $7.00 on at Acme. I think it might be this. Kashi cereal is on sale this week for $3.00 each (2 for $6) . When you buy 4 you get $4 off instantly. 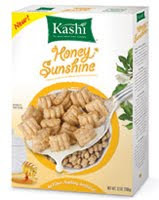 Use 4 of the $1.50 off Kashi Honey Sunshine Cereal plus the $4 instant savings = $.50 a box. Now, what to spend the other $5.00 on?